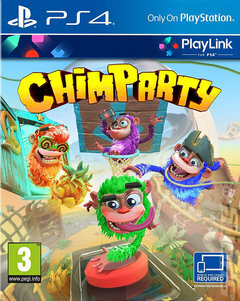 It doesn t matter whether you re new to gaming or the King Kong player among friends and family, there s something for everyone here, from flinging your chimp into a hoop, to escaping your rivals in a manic tag contest. Play across a prehistoric jungle, haunted castle, pirate harbour, alien landscape and wizard s manor, with changes in gravity, shape-changing antics and interactive elements to watch out for. Give your cheeky monkey the look of a winner, with selectable headgear, accessories and shoes, with the chance to unlock more as you play. And all your customisations and progress stays on the Chimparty app, no matter which PS4 you play on. Beat all-comers no matter the mode, with four different ways to play. FOR TWO TO FOUR PLAYERS: Board game mode - Reach the goal before everyone else by rolling the dice in a variety of mini-games. FOR ONE PLAYER: Survival mode - Hold on to as many stars as you can, for as long as you can, as you get some practice in the range of mini-games. FOR ONE TO FOUR PLAYERS: Blitz mode - Play through 10 rapidly changing random games to collect stars the chimp with the most stars at the end, wins. FOR ONE TO FOUR PLAYERS: Custom mode - Take your pick between all 90 levels and customise your play session, just as you like.